We are pleased to inform you that our Hidden Gem stock of May'14 - Rane Brake Lining Ltd (BSE Code: 532987, NSE Code: RBL) has already achieved its target giving absolute returns of 105% to our Hidden Gems members within period of 2 years. Our team suggested Buy on Rane Brake Lining Ltd at price of Rs. 200 on 31st May 2014 with a target price of Rs. 410. Target is already achieved, stock has made 52 week high of Rs. 427 on BSE on 29th Jan'16 and today closed at at Rs. 391, giving as on date returns of 96% to our members. For Mar'16 quarter, net profit of Rane Brake Lining rose 42.37% to Rs 9.14 crore as against Rs 6.42 crore during the previous quarter ended March 2015. Sales rose 8.81% to Rs 123.57 crore against Rs 113.56 crore during the previous quarter ended March 2015. Rane Brake Lining registered sales & operating income of Rs. 448.42 crores for the current year as against Rs. 416.41 crores for the previous year registering 8% growth. The Company’s overall OE sales registered a healthy growth of 10% and aftermarket and railways registered a growth of 7% and 4% respectively during the financial year 2015-16. 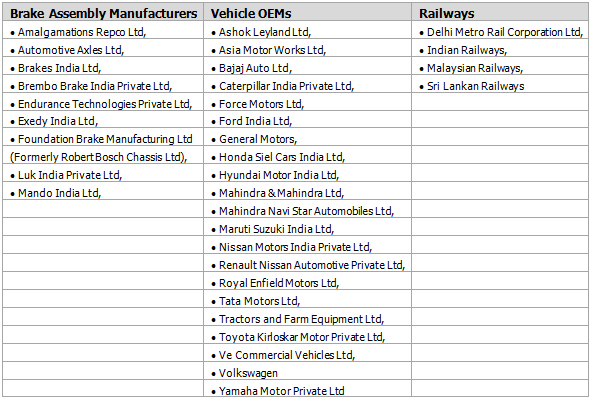 Company enjoyed good growth in the OE segment on the back of new business in passenger car and two wheeler segments. The company had a challenging time in the aftermarket segment, but with the introduction of several new products, managed a healthy growth. Rane Brake Lining has posted healthy PBT of Rs. 35.48 crores in FY 15-16, i.e. up by 72% compared to previous financial year. During the financial year, weakening of Japanese yen helped in reducing overall material cost. The company was able to improve the profitability significantly through sustained cost savings initiatives and manufacturing process improvements in the shop floor. Subscribe to Hidden Gems & Value Picks and start making educated investment decisions by investing in high quality small and mid cap companies backed by strong fundamentals. Avail attractive discounts by subscribing to our combo packs, click here for details.